Remembering the Genius in Genie, and in Life. I have loved the living picture, the spoken word and all performing arts as long as I can remember. Both of my parents love literature, music and enjoy the arts, both in their own unique way, and that love has been passed on to me, my brother and my younger sisters. And as much as I hate to admit it, there was a person in my life once who had a profound impact on me when it came to film. I liked watching films prior to this person, but with this person (who was with film, like in everything in his life, fanatic) my appreciation and notions of entertainment grew into a full-blown love and passion that I can barely keep up with recently. After high-school (A-levels, lukio or whatever else you might call it) I went to Ireland for the Dublin Business School – School of Arts, where I started to study Film, Literature and Drama . The teachers I had were probably some of the most dedicated group of individuals I’ve met as they were teaching what they loved, though maybe not always what they knew. But it was enough to fuel the already ignited passion within. Life has swept me away to duty and command – but every now and again I get to return to this once so strong passion. Watching film after film, show after show and I always return to those I’ve learned to love or lived with for years (Polanski, Allen, Gilliam, Coen’s and single films from more obscure directors – well, maybe not obscure to you, but obscure enough for me). Perhaps that’s why when I learned the news of Robin Williams, and mere day later of Lauren Bacall, I was genuinely upset. I cried in the bus on my way to work after I saw the breaking news on Robin Williams (silly people around me asked me if I needed help – how could they not understand we were beyond help; the Genie had died?!). But Williams was THE talent for me for very long time. Him and Billy Crystal. They hold no comparison. But also, it reminded me how little we know of those we admire, and of the fragility of life as we know it. Robin Williams, for me, has always been there. Always. Suicide, eh. Shaming, blame placing – seriously? Body’s not even properly cold yet. I don’t think the guilt and shame put upon his previous wives is fair (financial issues, divorce bladibla); depression is real depression is suffocating and depression – most of all – is beyond words, and when it comes to that stage, even the legend himself said, in the role of Lance in World’s Greatest Dad:”If you are that depressed, reach out to someone. And remember, suicide is a permanent solution to a temporary problem.” Did he? We will never know. I admire the spirit. I admire the strength. And I do, despite it all, admire the facade. I admire the man who despite his own demons found the time to give to those deserving (the troops, the sick, and other). In an interview with Ellen, from 4:05 there’s a bit where Williams mentions his heart surgery, getting a second chance in life, refuting possible depression and “feeling alive”… Haunting. And not to remember, the man was out to spread joy despite his own demons, so make sure you watch till the end to see the Janet Jackson impression. Priceless. All this. All the media hype. All the talk of what his life was like. And the actual act of William ending it all… Goes to show, we really know anything about the people we see in the public eye. The fact whether or no I knew him doesn’t change the fact that I will miss him. He was one of the first actors I was aware of as an actor, as a person whose job it is to create what we see for entertainment. His films were a part of my growing up. Mrs. Doubtfire was probably one of the first films that had me laughing that genuine “I know what’s happening” here laughter, as my parents were breaking up. Jumanji was a film our dad showed us, and I remember being utterly terrified for weeks on end that I’ll be sucked into my board games and monster will take me (over-vivid imagination, perchance?) and to this day, Dead Poets Society, Aladdin, Jack, The Birdcage, The Fisher King, Hook and Mork & Mindy top my favorite’s list. There are so many of his films I haven’t seen yet, or should see again. I still haven’t comprehended the fact that this amazing man isn’t there. 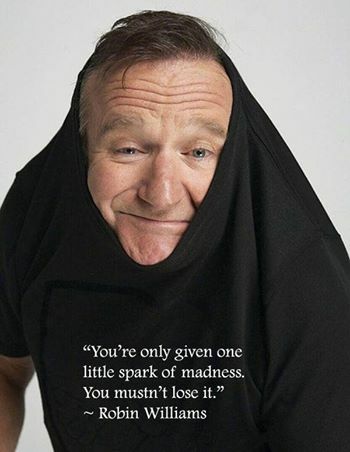 And I haven’t comprehended the fact that though I know first-hand what depression can do, that it can still break someone so … Williams.